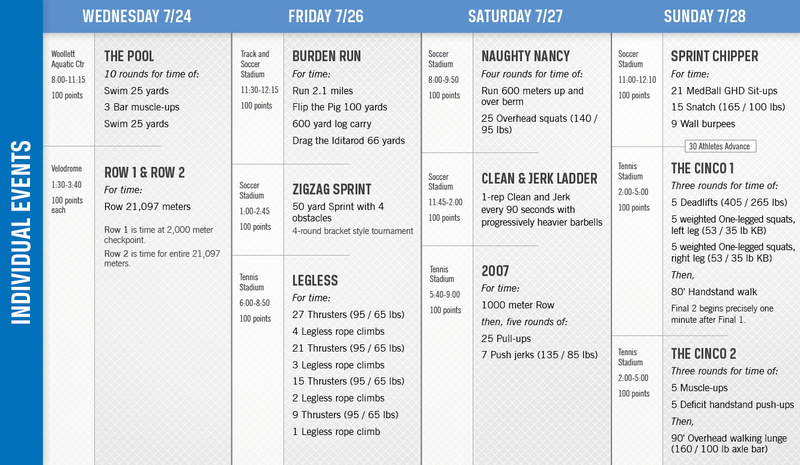 Individual athletes at the 2013 Reebok CrossFit Games will compete in a wide variety of events. In each event, the athletes will earn points based on their finish order. The athlete with the most points after the final event will be crowned the Fittest On Earth. Athletes that do not finish within the time cap will have one second added to their time for each repetition not completed. See below for the complete description of all the Events that have been announced (click the red bar to expand). Athletes will be ranked by the weight of their heaviest successful clean. Partial credit will be awarded for a successful clean with a failed jerk after the first successful clean and jerk. If an athlete cannot successfully clean and jerk their opening weight, they are eliminated from the competition. Women’s Weights (pounds) - 145, 150, 155, 160, 165, 170, 175, 180, 185, 190, 195, 200, 205, 210, 215, 220, 225, 230, 235, 240, 245, 250. Row 1 will end at the 2,000 meter checkpoint. Athletes will receive points based on their times at this point. There is no scheduled rest at the checkpoint as the race continues. Row 2 will be scored by the total time to finish the entire 21,097 meters. Finishing order at the 2K checkpoint (Row 1) will have no bearing on the scoring for Row 2. 11:00 a.m. - 12:10 p.m.
Top 30 men and top 30 women advance to the final. Time Cap: 7 minutes, The Cinco 2 begins precisely 1 minute after the time cap. This event will begin 1 minute after the end of the time cap for The Cinco 1. There is a 7:00 time cap for this event. Athletes will race against each other head to head in a 4-round bracketed tournament. Six athletes will race against each other in heats. Each round, the top three finishers from each heat move on to the next round of the sprint. Places 1-6 will be awarded to the athletes in the final round, ranked by their finishing order. Places 7-12 will be awarded to athletes from the third round based on their times. Places 13-24 will be awarded to the athletes from the second round, based on their times. Places 25 on will be awarded to the remaining athletes based on their times to complete the sprint in the first round.